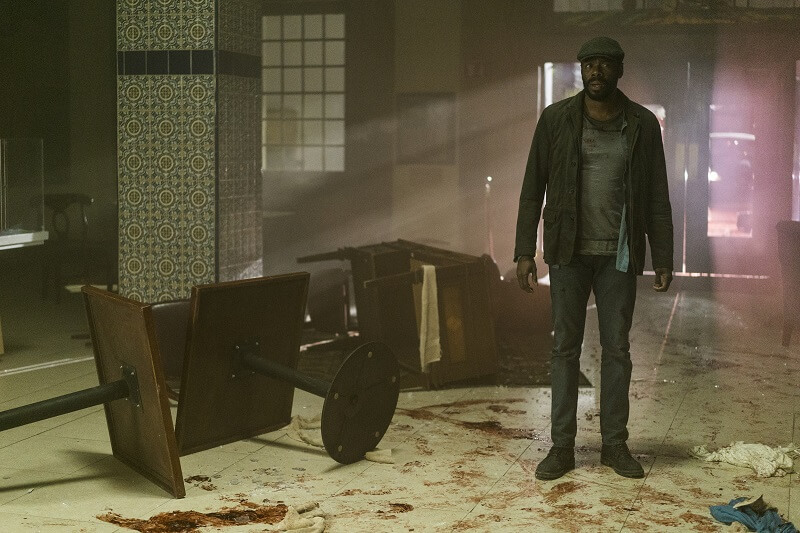 Fear the Walking Dead returned tonight with another great episode titled “Burning in Water, Drowning in Flame.” After last week’s “100” which centered completely around Daniel Salazar, this week we return to the ranch with Madison and company. However, Daniel and Strand do pop up on a few occasions during their trip to the hotel to find Ofelia… who Strand knows isn’t there. I have to say, I’ve been really impressed with this third season of Fear the Walking Dead so far. The show seemed to get quite a bit of flak during its first two seasons. People would say it started out too slow and it was just mimicking The Walking Dead in certain ways. Now, of course, a show set in the same universe as the extremely popular The Walking Dead was going to face unfair comparisons and trolls. Thankfully though, Fear the Walking Dead has gotten through it and is really beginning to come into its own. One thing Fear the Walking Dead has done with its new season is introduce some very compelling new characters. I really enjoy the complexities that are beginning to rise with the polar opposite Otto brothers. When their father is gone, together they are going to have to lead the ranch. With such drastically different views on things, will they be able to do that? Even more so, would Jeremiah leave someone else to be in charge perhaps and what conflict could that cause? Dayton Callies as Jeremiah Otto is another character that I’m starting to really like. I feel like this episode of Fear the Walking Dead was a really strong one for him and you get a good sense of where he stands on things. A favorite part of this episode for me is the conversations between Jeremiah and Nick. Jeremiah already knows about Nick’s past through Madison and uses that in his conversation, the same way Madison does with Troy later. At first, there’s a sense of tension between Jeremiah and Nick while they feel each other out. Then comes a sense of understanding and admiration and finally acceptance of each other. They even share a laugh together with Jeremiah’s story about what made him quit with the drinking. The conversations were heartfelt and emotional and it appears Nick has chosen the ranch to make his home. Jeremiah has seemingly given the old couple’s home to him along with a revolver to hang over the door. When this season of Fear the Walking Dead was talked about, a female villain was teased. It was also said that many would be able to relate to this character in terms of what her ultimate goal was. Well, while we didn’t see a female villain just yet… a group did reveal themselves in a big way. If you’ll remember back to “Teotwawki” the ranch lost contact with one of their outposts. Madison along with a few others volunteered to head out and investigate. When they find the outpost in tonight’s episode, the bodies of their members who were stationed there have all been piled and burned. Furthermore, the group comes across a very gruesome scene involving a survivor, a crow, and an exposed brain. It may seem like this new group is a bunch of savages… but have they really done anything worse than what Troy has? How about Troy being all about taking out the infected at the prison bus? I mean he was really immersed in that moment and even began boasting about taking them all out in under a minute. Sure, Madison sided with him but I think it was more to appease Troy as the leader than being a tactical decision. However, later, the man who thinks this apocalypse is his calling, walks his men right into a trap. What I really liked is how Madison asserts herself over Troy and breaks him down without violence or threats. She finds the chinks in his armor thanks to her talks with Jeremiah. She showed better leadership over him to his men and pushed him to the point where he was ready to kill her. Strand and Daniel also got some brief screen time in this episode heading to the hotel where Strand claimed Ophelia is. I initially liked Strand but his character in this episode felt entirely off. Strand is a conman and I certainly expect him to swindle anyone he hasn’t spent time with. Telling Daniel, however, that Ophelia was at the hotel… it just didn’t make sense to me. I’m not sure how he expected to talk his way out of that, not to mention with someone like Daniel. As it turned out, of course, the hotel was overrun with no survivors in site. This was a moment where I was happy to see Daniel leave Strand. Honestly, at that point, I really didn’t care if he would have died. This was a fantastic episode for Fear the Walking Dead and the best so far of the season in my opinion. I wasn’t entirely sold on Jake’s view of things but I understand what he’s saying about saving the culture. A romantic fling also seems to have begun between Alycia and Jake. We’ll have to see how that plays out down the road. 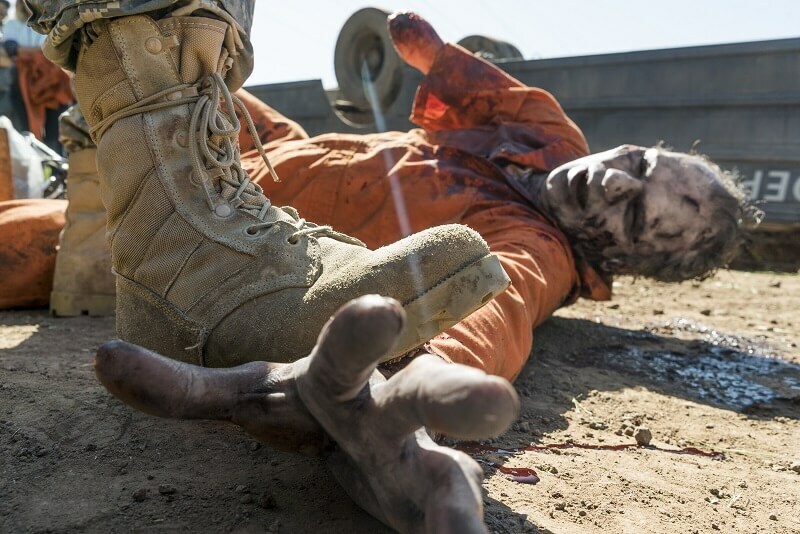 Did you catch tonight’s new episode of Fear the Walking Dead? If so, what did you think? Be sure to let us know in the comments below. Also, be sure to check out the season two premiere of Preacher, which immediately follows this episode. 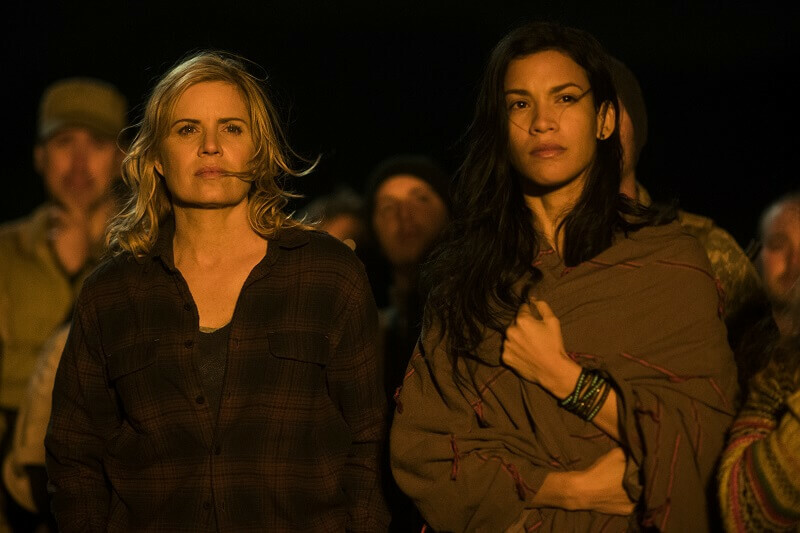 Verdict: Fear the Walking Dead came back with another amazing episode tonight following last week’s “100.” Madison and Troy came face to face with the what appears to be the “villains” of the season and those responsible for killing Travis. At the ranch, Jeremiah and Nick come to terms with one another with Nick ultimately deciding to stay while Luciana leaves. Jake tells Alycia his feelings on what’s important while a romantic fling begins between the two. This episode provided a great blend of both action and emotion. A new threat reveals itself to Madison and Troy as they search for answers. Alicia must reconcile with her past decisions.